Developed by Arenanet for Windows. Currently in development and no release dates have been announced. • A dynamic, interactive gaming experience. Your choices and actions have a real effect on the world around you. Will the besieged villagers fight off the rampaging centaur horde or succumb to the attack? You decide! • Personalized storylines. Guild Wars 2 is YOUR story. Follow your own customized storyline as it evolves from choices you made at the beginning of the game. • New depths of character customization. You choose from eight powerful professions and from five races— the defiant humans, the feline charr, the mystical sylvari, the mighty norn, or the ingenious asura. • Innovative combat. Featuring amazing skills, combos, improvisational tactics, and environmental weapons, the Guild Wars 2 combat system puts the fun back in MMO battles. • Fierce player vs. player action. Take up arms in epic world vs. world warfare or test your skills against other players in player vs. player (PvP) arenas. • A rich, fully realized fantasy world. Developed by one of the most talented and widely respected teams in the industry, the vast world of Tyria has been brought to life with incredible attention to detail. The control & movement system is going to be significantly changed. In particular, mouse movement in the form "click to move" will be removed from the game; however, target locking will still function. Guild Wars 2 will be a true 3D environment which will allow characters to jump over obstacles as well as swim and dive underwater. Flight will not be a featured character capability in Guild Wars 2. The original Guild Wars game engine has been improved upon with support for more detailed environments and models, better lighting and shadows, new animation and effects systems, plus new audio and cinematics engines and a more flexible combat and skill-casting system. - Norn; They hail from the frozen north--the norn, a race of heroes. These massive, shape-shifting warriors prize individual valor and victory above all. They trust only the power of steel. The norn do not beg or grovel for the favor of the Gods, no. Instead, they revere the spirits of animals and draw strength from them. 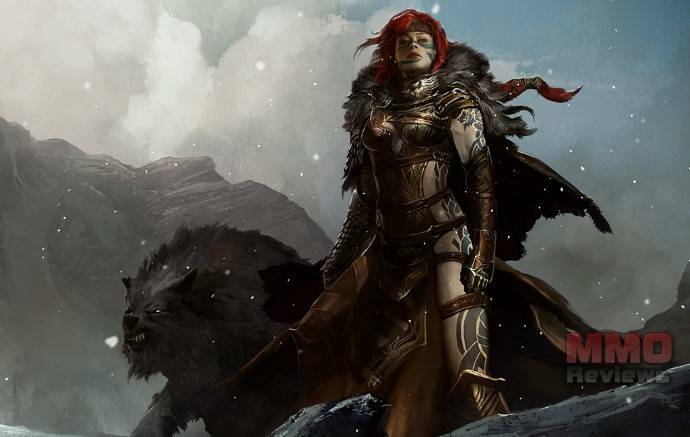 The norn can assume the form of their sacred totem beasts--bear, snow leopard, raven, and wolf--and call upon their power whenever they do battle, which is often. Guild Wars 2 will utilize a very different system for quests than Guild Wars 1. Instead of the standard green exclamation point above an NPC's head to mark a possible quest, Guild Wars 2 will use a new Event system. In this system, events will happen with or without the presence of the player, and if a player happens to be present at the time of the event, then the player can complete the quest by participating in the event, and the outcome of the event may affect if, or what kind, of event may happen soon thereafter. Three examples were provided to illustrate how this system may work. Looking for more MMORPGs,Pay 2 Play MMOs games? This game isn’r even out, you shouldn’t be able to take ratings until they are released. Lol. Such an inaccurate and biased site. Shame. Back to mmohut I go. I think the ratings are done by users, which may speak volumes about the community. Tons of people have been playing the demo at gaming conventions like Gamescom and Pax. This game might not be out yet, but tens of thousands of people have already played the demo. So you can judge. And also, GW2 features some very new things like Dynamic Events and Dynamic Combats, and those things are just amazing. I think they didn’t say a word too much about GW2. I’ve read a lot about Guildwars 2 (almost everything printed about it really) but even I don’t think that it’s fair to vote on a game before it’s released – whether you’ve played a mere 30 minute demo or not. From the amount of content and immersive nature offered by the game the demos a few people have played are nowhere near enough to judge the entire title by. Especially since things are still changing! They decided to redo how skills and traits are acquired and the quest structure behind them. Additionally, the logo presented her eis incorrect. It’s a very old logo when the game idea was first thrown out, more than a year out of date. MMOreviews, please at least put a little effort into putting true and accurate information on your site. Can’t wait for this one, and the best perk is it isn’t EA or Bioware, I bet they actually have a customer service that exists and speaks english. It sounds like it’s going to be a great game, but you have to wonder about the viability of a company that has not yet delivered the game 2 YEARS after they started writing about play testing it. There is one little problem most people seem to not understand: beta is not demo. It may serve as a publicity stunt, but it’s still beta. And rating things based on a beta has little value. 1) The PvE leveling system is excellent. Each level takes about the same amount of time and progression of difficultly (less grind feel) to complete. The world/amount of content is enormous and dynamic. 2) The “relative” level mechanic is excellent. In other words, when a higher level character enters a lower level area his relative level/power is reduced. No more high level characters power-leveling or farming lower level content. 1) LOOT: While it’s great that loot is individually assigned (no rolling for loot crap), the fact that drops are all so generic and similar is very disappointing. The addictive quality of a MMORPG has alot to do loot/drops. If there isn’t that small chance to get an uber rare drop or skin that everyone is coveting, then PvE loses a lot of its luster. Will there be ecto? End PvE content like Underworld and Fissure of Woe?? If not, the staying power of the game may be severely limited. 2) No HALL of HEROES (HoH): One of the best aspects to PvP in GW1 was HoH. A continuous bracket tournament WITH DIFFERENT MAPS where the winner effects world environment buffs. As it stands now, PvP is simply pick-up games played on the same map (albeit a nice map) over and over. Gets old fast. 3) SKILLS: They dumbed down the skills dramatically from GW1. While I understand they had to reduce the number of skills, because balancing was almost impossible, I never guessed they would basically take the strategy of “builds” out of the game. Figuring out what build you needed to complement your party members in both PvE and PvP was one of the great joys of GW1. That’s basically gone now; Dumbed down to make the game more appealing to the masses. Bottom Line: Unless they change a few things to generate that addictive quality, then the common masses and their flea-sized attention spans, that they are now appealing to, will quickly lose interest. The game “demo” was out before open Beta was out. This isn’t a “demo” for the actual game, it was a loose demo for the BETA for the game. At this point, tons of us have played the Beta, which is even closer to what the actual game will be like than the “demo”, and we STILL don’t have enough information to give it a rating because so much of the game has still yet to be developed. The devs have even said that they aren’t finished with the game engine at this point. This game’s ratings should not be open, it has not been released and more than that, it is months from being near finished. Playing the first open beta weekend blew my mind. I’ve always been very tactical, standing back and puzzling my way through whatever game I play, whether it was Doom, WoW, or whatever. GW2 sucked me right in and before I knew it I was just button mashing and running madly from fight to fight for 4 levels before I finally stopped myself to figure out what the abilities I was using were. Then I was right back into the battle. The other overwhelmingly awesome aspect for me was that I tend to be a loner, and that’s okay but I always feel like I’m missing something. But this game just naturally pulls everyone together so you are all fighting common enemies and that feeling of teamwork really rocks. I was wondering if the second open beta weekend would feel as awesome and it still does. If I’m not mistaken Warhammer Online featured dynamic events. It felt alot like warhammer with better graphics. At least I can jump over things now. Same old same old… GW2 will offer the same mmo experience as we seen so many times before. “The secret world”will be my game for the future. To Winderboore and his ignorant comment. I might agree with you on average MMORPGs. They tend to be more of the same. But GW2 is a very unique experience. It’s breaking down barriers in the community by allowing people to play with each other NO MATTER WHAT. In other games, if you’re not “the right class” or “the right level” you are segregated. GW2, any level, any class, any amount of people can get together and have fun. Not only can you do this, but all level content is viable to do even at lvl 80 due to the level scaling. So all 35 dungeons, all world areas 1 to 79. The dynamic event chain zone Orr, all of it is viable to do at any time, and your rewards are scaled up to your real level. Loot is your own, so no fighting over drops, etc etc. This is bringing people back together. High levels helping low level characters. Grouping because it’s fun and not worrying about loot or exp. PVE dynamic events that change the world, have consequence for success and failure. This isn’t just another MMO where mobs stand around in a field and some NPC with a ! above their head tells you to go kill 40 of them. This is PVE the way it’s meant to be, for purpose and fun, not for “Level grinding. Don’t even get me started on their awesome SPvP Battleground system or their amazing WvWvW Siege PVP that puts games like DAoC and Warhammer to shame. If you think GW2 is just another MMO, then you obviously haven’t played it. As a long time MMORPG veteran, from the days of UO and launch day 1 EQ back in 1999, all the way to Tera and Blade N Soul, and everything in between, I do not say this lightly. Garfield, you have a Boyfriend and Girlfriend at the same time? You’re dating both of them at once? Do they both know that? … If so, just.. keep doing what you’re doing then… if not… that is really f*cked up and the reason why people think BI’s are so gross. The problem with micro transaction profit models is the sense of risk involved when companies like NCSoft tarnish their brand by shutting down profitable MMOs with very little warning. I made some micros just before they completely-out-left-field gave COH fans three months notice and unexpectedly shut down Paragon Studios and I’m feeling pretty burned by that. I totally have fun with GW2. It is stunning, it has stuff that is catered to every gamer -type, the reward schemes and content are captivating enough to keep you active.. it’s just on the whole a terrific MMOG. Undoubtedly one the better ones that’s been put out in quite a few years.